Batiste Dry Shampoo has an innovative ‘no water needed formula’. For over 40 years it has provided a way to quickly revitalise hair between washes. While the product had a cult following amongst festival-goers and professional stylists, it had begun to look tired, and retailers had fallen into the habit of tucking it away on their bottom shelves. To increase sales the brand needed to rise up the fixture. We started at the beginning, back in the 1970s. We analysed their packaging through the decades and poured over their latest research, insight and marketing documents. 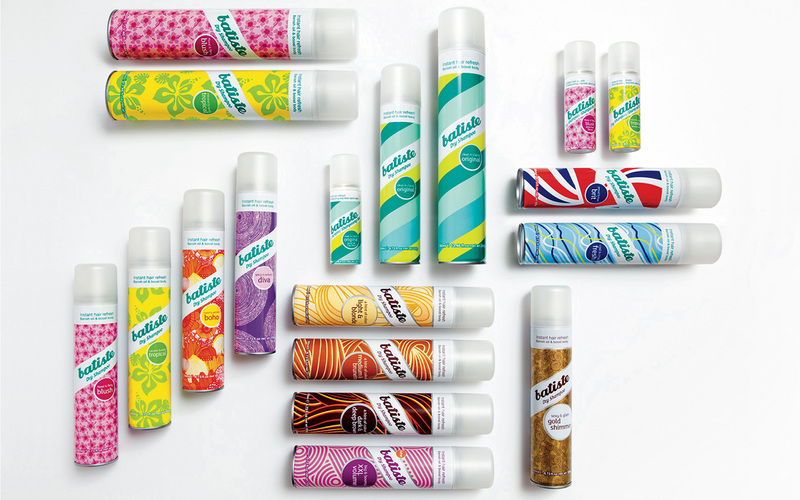 We uncovered the reason retailers banished Batiste to the retail wasteland was because it looked unstylish and inconsistent: the range contained sixteen different products, which had evolved over time and now looked very different. We also identified that the convention within the dry shampoo market is for sanitised packaging with little self-expression for individual products within ranges. The Batiste brand has been built on its inherent quirkiness. So while inconsistency was the problem we also felt it was the key to Batiste’s personality and a way to create differentiation. We concluded that we required a way to control certain elements of the design, but allow others to celebrate their individuality. We needed an idea to frame our approach and liberate future products. Our inspiration came from the time that the original Batiste product was launched: the 1970s, and the TV series Charlie’s Angels. This became a neat way to think of the products as a unified group, but each with its own distinct personality. Our design approach developed more synergy across the range, but by creating this strong framework we freed up the rest of the can to be more playful. After our redesign retailers like Boots and Superdrug started celebrating it with prominent displays.